This is the third episode in a series where I converse with Classicists about either books or articles that they have published, their current research interests, or just unique classes and topics that they are teaching and exploring further. In today's special guest episode, I am joined by Dr. Amy Pistone, Visiting Assistant Professor of Classics at Notre Dame University in South Bend, IN. Her dissertation, titled "When the Gods Speak: Oracular Communication and Concepts of Language in Sophocles", explores the misunderstanding of oracular or prophetic speech in Sophoclean tragedy and situates his plays within the intellectual context of late-5th century BC Athens. Her primary research areas include Greek tragedy in general, Greek and Roman drinking culture, early Greek philosophy and scientific thought, women in the ancient world and feminist theory, reception and re-performance of ancient theater, and pedagogy. In particular, Dr. Pistone is interested in the role that drinking (both proper and improper) plays in the ancient Greek world and uses this to reflect on the modern world. She has presented several papers (including "The DYskoleteron Δυσκολώτερον Σκόλιον: A New Model of the Skolion Game in Antiquity" and “Take a Joke, Take a Drink: Ancient Greek Drinking Culture”) and has taught several classes to that effect (including "Drinking (and) Culture in the Ancient World" and "Intoxicating Poetry"). She also has an interest in ancient athletics, and when she is not molding the minds of future classicists, she referees collegiate football and basketball games. 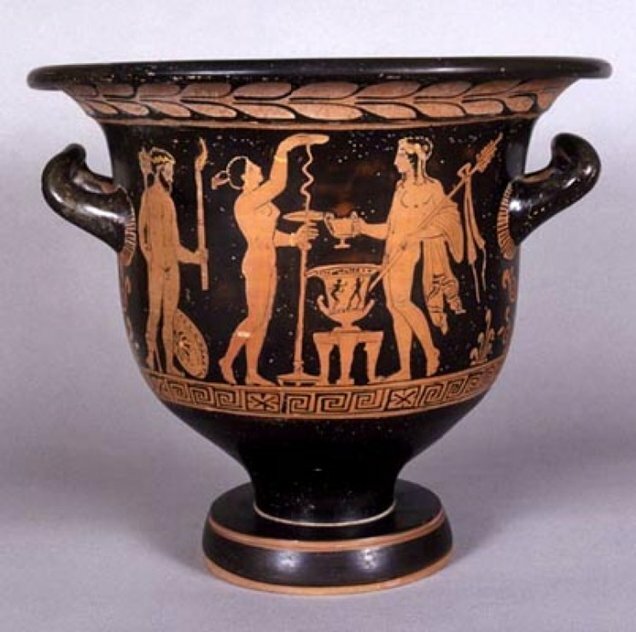 So due to the unique confluence of these two interests, I invited Dr. Pistone on to talk about ancient Greek drinking culture with a side of sports, aka how college students can relate to the ancient Greeks. 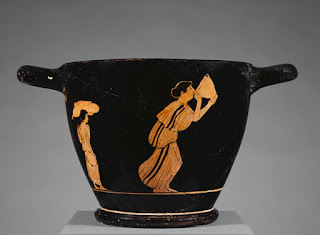 And some great vases with women having parties! One of Dr. Pistone's favorite silly vases! 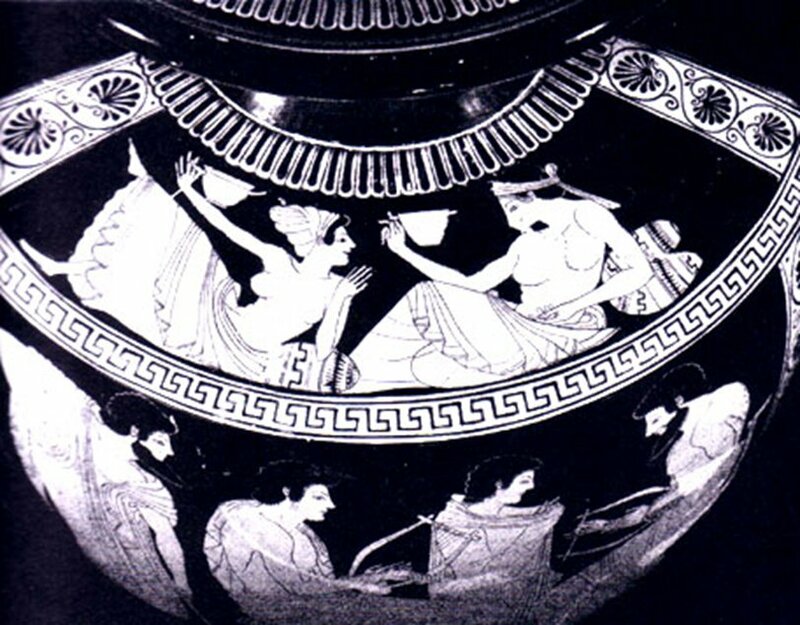 Goldman, Max L."Associating the Aulêtris: Flute Girls and Prostitutes in the Classical Greek Symposium." Helios, vol. 42 no. 1, 2015, pp. 29-60. Slater, W.J. "Symposium at Sea". Harvard Studies in Classical Philology, Vol. 80 (1976), pp. 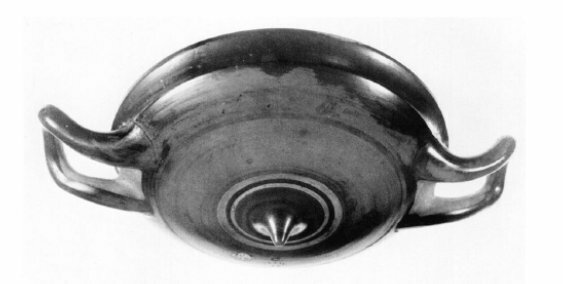 161-170. Topper, Kathryn. "The Imagery of the Athenian Symposium". Cambridge University Press (2012). Vickers, Michael. 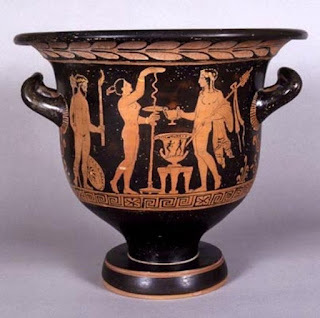 "A Kottabos cup in Oxford". American Journal of Archaeology 78 (1974).